The journey from the south rim to the north rim of the Grand Canyon takes about 5 hours but is very scenic, involving a 215 mile route that descends from the pine-covered Coconino Plateau near the canyon into the flat, empty but very colorful Painted Desert in the Navajo Indian Reservation, up US 89 past the Echo Cliffs, across the Colorado River near Lees Ferry, then south alongside the Vermilion Cliffs, before climbing steeply into the Kaibab National Forest and to the small community of Jacob Lake. Basic visitor services are available here - a gas station, lodge, campground, general store and restaurant. From the village, AZ 67 provides the only paved route to the north rim. 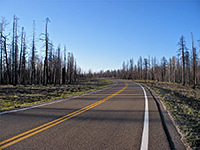 As with US 180 approaching the south rim, the road passes through lush Alpine meadows and forests of fir and pine for 50 miles (part of the Kaibab Plateau), with only occasional signs of development. The road has recently been designated the Kaibab Plateau - North Rim Parkway, and the NPS has installed many informative notices at laybys along the route. Apart from the main highway, the two main unpaved routes to the north rim are Buffalo Ranch Road across House Rock Valley, which leads to points on the east of the plateau such as Saddle Mountain and the Nankoweap trailhead, or Ryan Road (FR 222), that heads south from Fredonia into national forest land and passes many intersections with other backcountry tracks. This is the approach for such beautiful but rarely seen Grand Canyon tributaries as Muav Canyon, Jumpup Canyon, Tapeats Creek and the Thunder River. The largest meadow along the main road is De Motte Park, which stretches for 10 miles mostly on the west side of the highway, and is a good place to look for mule deer who graze on the grassy expanses in the morning and evening. There are several facilities near the lower end including a general store, restaurant and campground, while for people who prefer free camping, the places closest to the national park are a short way along FR 422, branching west from the main road 4.5 miles before the boundary. A few miles after the park entrance station (elevation 8,824 feet), a paved but narrow and winding side road leads across the Walhalla Plateau to various viewpoints of the canyon to the east, while the main highway continues to Grand Canyon Lodge and the visitor center. Unlike the over-developed south rim, there are relatively few facilities here. 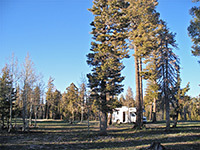 Accommodation options comprise the lodge itself, an 83 site campground (no hook ups) and some log huts, scattered around the neighboring forest. The nearest chain hotels are 82 miles away in Kanab, Utah. Also on site are a general store, cafe, gas station and ranger station. From the lodge two short trails go to Bright Angel Point, the most popular observation point on the north rim, and along the edge of The Transept - a deep, sheer walled side ravine. Bright Angel Point has good overlooks of Roaring Springs and Bright Angel canyons far below. The North Kaibab Trail runs through these canyons, and several miles of its course are visible from the viewpoint - this trail begins a few miles north of the main visitor complex and is the only maintained path into the canyon from the north rim, although a complicated network of logging tracks extends west from AZ 67 into the Kaibab National Forest, linking with Ryan Road, and allowing access to other canyon overlooks, as well as (free) primitive camping, but 4WD vehicles may be required. Amongst these more remote viewpoints is Point Sublime, on the edge of a sheer cliff overlooking the narrowest section of the canyon, where the south rim is a little over 4 miles away. Of the other, shorter paths on the north rim, best are the Widforss, Cape Final and Uncle Jim trails. North Rim Trails - details of all maintained paths. 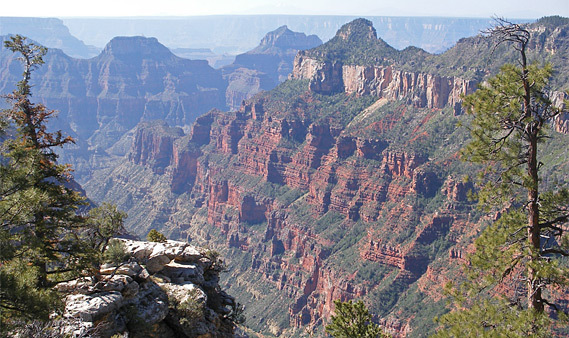 The north rim has two main viewpoints towards the east, reached by the side road. One is Point Imperial, the highest in the park at an elevation of 8,803 feet, which apart from the canyon, here relatively shallow and less branched, also overlooks large areas of the Painted Desert and the Navajo Reservation. 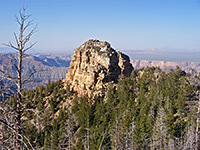 The second is Cape Royal (7,865 feet), perhaps the best of the north rim sites. The cape is 20 miles from AZ 67, right at the end of the road which becomes rather narrow and twisting over the last couple of miles as it runs along a steep sided ridge. There is a large carpark and a short nature trail leading to the point, where the ground drops away steeply in most directions affording superb views east, south and west along the Grand Canyon. Nearby is the short path to Cliff Spring. 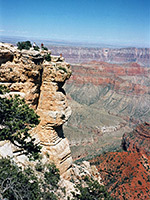 North Rim Viewpoints - full descriptions and photographs of ten overlooks along the canyon edge. 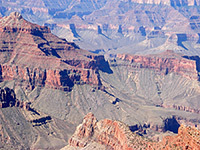 As the north rim is on average 1,300 feet higher than the south, the climate is significantly different. Summer temperatures are usually about 5-10 degrees lower, nighttime frosts may occur any month of the year and in winter/spring the approach road is closed by snow, although intrepid visitors may still reach the canyon by two or more days cross-country skiing. The visitor season is usually limited by the weather to only 6 months each year, from mid May to mid October. 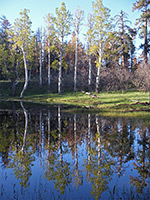 North Rim Weather - more information, and climate averages.